High Q’s new training venue is in an old flour mill, located on the bank of the River Calder in the former Mill Town of Brighouse. The venue has the benefit of being indoors and yet offers a maximum height of 16 metres (over 50 feet). This exposure to height, and the structure of the venue ensure that the training environment provides realistic situations helping our trainees to be more job ready. The venue has great transport links; within easy walking distance of Brighouse rail station, and by road is an easy commute to Leeds, Manchester, Bradford, Doncaster and Sheffield. The venue is central to the town, and for anyone staying it is an easy walk to hotels and restaurants including the Waterfront Hotel, and the excellent Miller’s Bar and 47 Grains restaurant. Our training staff just got bigger and more qualified! We have been busy running courses in the UK, Japan and Australia and along with getting some extra quality people on-board, more and more of our staff have progressed to Instructor level. Why is this important? Well, you know that when you come to High Q, you are getting instruction from training professionals, not just some level 3 who has been dragged off a worksite. 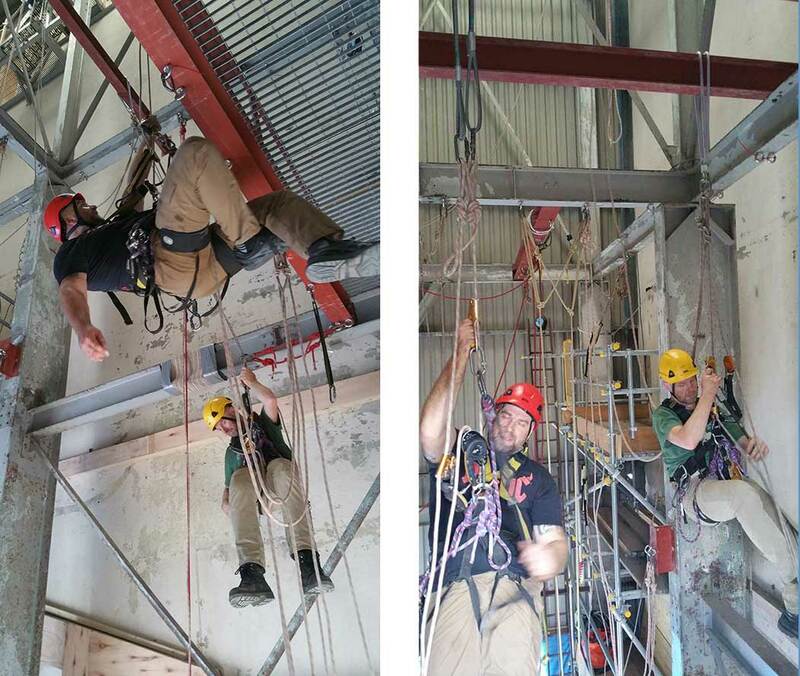 High Q’s directors, Craig Shaw, Karl Raby and Peter Wood are also IRATA Assessors. They guide the training programs for all our High Q entities UK, Australia and Japan. Their experience as Assessors and Instructors helps greatly when it comes to understanding current best practice across the globe, and whilst serving on IRATA committees, Peter and Karl have both contributed to the development of the IRATA Training and Certification Scheme. The IRATA training week and the 3rd party assessment are rigorous and tough, and whilst we our proud of high pass rates, we understand that it’s possible for anyone to fail on the day. So, if you do blow your assessment, or choose not to assess at the end of the week, then we provide another course for free, and you’ll only pay for the additional assessment. High Q are a Full IRATA training member with permanent training facilities in the UK and Australia. We provide regular scheduled IRATA training courses for the internationally recognized IRATA level 1 training course, IRATA Level 2 training course and IRATA Level 3 training course. All assessments are performed by external, independently IRATA certified assessors. We also provide ad hoc training throughout Europe, Australia and Asia for corporate clients. On successful completion and registration following an IRATA training course, the trainee will receive an IRATA logbook, identification card and certificate, which unlike many other qualifications are recognised around the world. Only IRATA qualified personnel are permitted to perform industrial rope access work aboard offshore oil and gas installations in UK, Australian and most other international waters.